I’m pretty sure that I’ve been woefully ignorant on all things brie-related because I don’t think I ever considered eating brie with anything other than sweet fruits or honey drizzles, but the other day I decided to give a savory spin a go when I realized that a package of near-forgotten cocktail sausages and a wheel of brie cheese were both nearing their sell-by dates as they lurked in the back of my fridge. 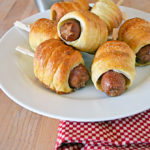 After bit of googling and a whole lot of finger-crossing, I realized that my expiration-fighting experiment had paid off: the garlicky, herby, pastry-wrapped melted brie with smoky cocktail sausages was… ugh, better than I can put into words honestly. Seriously. And I think it looked pretty cool, too. Well truthfully, the first attempt wasn’t AS cool looking because it took a few tries for me to figure out exactly what type of dough to use and the perfect length of time to bake, but the flavor alone had me hooked from day 1. On day 3 of testing, I got it down perfect. On day 5 I finished filming the how-to video (look for it below), and then the next day I was kind of sad that I didn’t have any more Pigs in a Blanket Baked Brie to snack on. 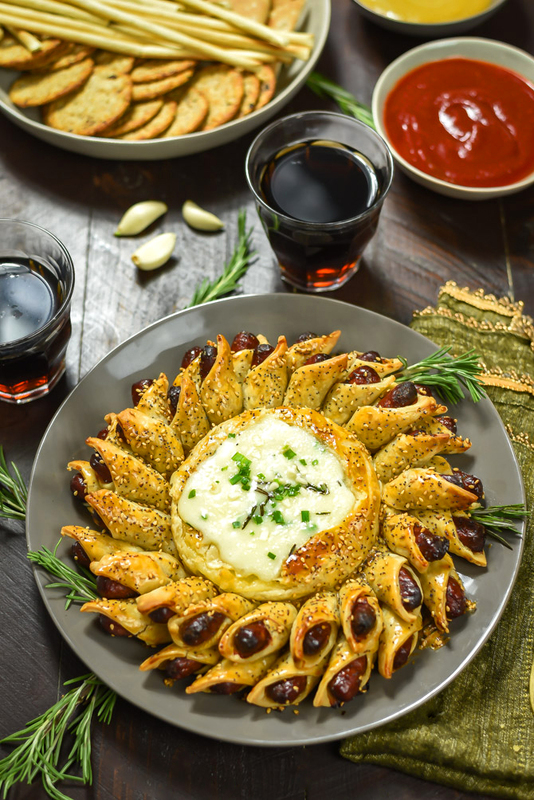 It’s one of those appetizers that you really just can’t get enough of, even though deep down you know that it’s probably not healthy to eat multiple wheels worth of cheese in a few days’ time. I get the feeling that you’d judge me if I said “YOLO,” so I won’t. I’d judge me, too. But you know… life is short. Carpe Diem. Other phrases that somehow seem more age-appropriate and okay for an unhip person like myself to say. Carefully cut off and reserve the top of the brie. Place the brie round on one unrolled pie crust. Sprinkle the brie round with the garlic, chives, and rosemary. Place the top of the brie over the garlic mixture. Lay the second pie crust over the brie. Use your hand to gently press the edges against the brie and smooth up the sides. Make sure not to press down on the outer edges of the crust– just focus around the brie. Cut even-sized strips all around the brie, like a sun, making about 18 cuts in total. Place one cocktail sausage at the outer leftmost corner of one of the strips at a slight angle. Roll it inward to wrap in the pie dough and press the edges to seal. Continue all the way around until the first layer of strips are all wrapped around cocktail sausages. You may have to move the wrapped sausages gently in the process in order to fit others– that’s okay. Continue to wrap the bottom layer of strips around cocktail sausages and push the top layer above them in the process. Brush generously with egg yolk, and sprinkle with sesame seeds and poppy seeds, if desired. Carefully transfer or slide the wrapped brie to the lined baking sheet. Bake the brie until the pastry is deep golden-brown, about 30 to 40 minutes. Allow to cool 5 to 10 minutes to allow the cheese to firm up slightly. 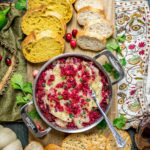 Cut the top off of the baked brie and serve warm. How many inches were your pie crusts? I can’t find pre-made pie crusts other than the Pillsbury Pie Crusts Dough (in a tube), which I have never used before so don’t know if it’s big enough. Would it be possible to use cheddar cheese instead? We don’t like brie. Unfortunately, cheddar won’t melt the same way. Is the pie crust, ordinary or puff pastry? Also did you fully cook the sausages before you rolled them up? Hi Wendy! It’s pie crust. And like hot dogs, the cocktail wieners are fully pre-cooked when you buy them, but I don’t pre-cook them before making them in the recipe. You can see all of the steps in the video 🙂 ! What brand of pie crust did you use? I believe this was just your standard Pillsbury pie crust! I used pie crust for pies in the refrigerator section by the pillsbury rolls but had a hard time rolling my weiners … taste scrumptious but looks nothing like Morgan’s!!!! What did it look like? What would you have done differently? I don’t mean this sarcastically, but the only one I can think of that barely qualifies as cheese with a similar consistency is…don’t ban me…Velveeta. Wow, this looks fabulous! Will definitely be making this soon! Thanks for sharing, you are a genius. Wouldn’t it be easier to transfer to the baking sheet if you did the assembly on the parchment paper, so you could use it to assist the lift? Just a suggestion. I was really hoping to see the transfer method you used as part of the instructional video. It’s very easy to accidentally slice through the parchment paper as you slice the dough if you do the assembly on top of the parchment paper to begin with. I prefer to just slide it onto the parchment after it’s assembled so I don’t risk a slice in the paper that could further tear when transferring. Looking forward to trying this for a holiday party this week. I would assemble it on a piece of parchment for ease of transferring, and then use a second sheet of parchment on the baking sheet. Don’t see that two sheets of parchment would be a problem. I worried about this issue also. I used a Pampered Chef pizza mover to move it from one parchment to another. However, next time, I will probably make it on the parchment on the baking sheet because I had no issues about accidentally cutting through the parchment. What other cheeses would you recommend using in place of the brie? Camembert would be very similar. 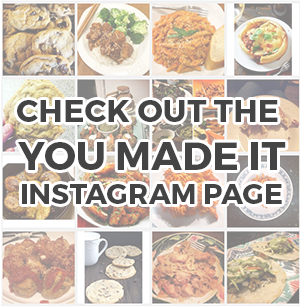 Someone commented on one of my social posts that they used smoked gouda and it worked well, though I’ve never tried it myself so I can’t personally attest! I need to know about Brie–isn’t it a wrapped cheese? And it looks likes you just eat all of the “rind”. I assume it softens in the oven. And when you cut the lid off after baking, can you eat the lid? Sorry, I’m sure some will say this is a silly question, but I don’t know these answers. Thanks for the recipe and it also looks beautiful. And yes, definitely eat the lid! It’s delicious. Would it work with the little mini hot dogs? I bought mini smoked sausages…did I buy the wrong thing? Or will they still work? can this be prepared of time and baked later? Do you think I could build night before and bake next day? I would like to build today for a party tomorrow evening. Should be okay if I refrigerate right? What other types of dough did you try? 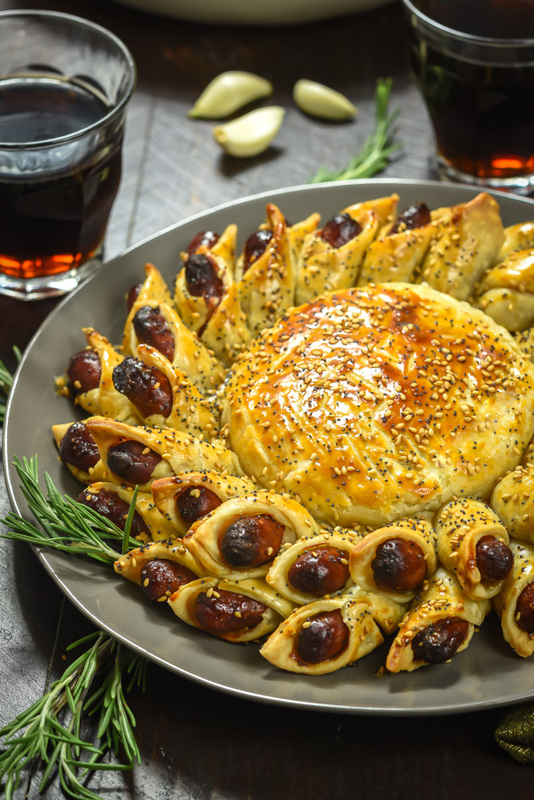 Have you ever tried crescent dough? I made this last night and it was a hit! I used a flaky pie crust and probably will not use that again. It broke apart way to easily but other than that it was delicious and very easy to make! I will be doing this again this holiday season for sure. Can I bake ahead and freeze. I wouldn’t cook it all the way and would not cut off the top of Brie. The reheat the day of the party? I would be wary of freezing the brie after baking– I’m not sure it would reheat well. 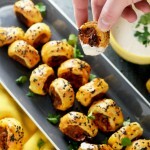 How far a head of time can the pigs in a blanket be prepared with out baking? I have to work during the day, and have the party in the evening! Do you think I can prepare everything and leave it in the fridge for the day before I cook it in the evening? Will everything still hold up? I think it should be fine, Katie! Just make sure you cover it well with plastic wrap so that it doesn’t dry out, which would be my main concern. Brush with egg before baking, not before refrigerating. I did this with puff pastry… I thought that worked out well…if you don’t mind it not turning out in a perfect wreath shape like Morgan’s! I made the mistake of sprinkling sea salt on top… thought it would be pretzel-like…. bad idea, the brie and the weenies are salty enough. Still, it was very tasty and I will do it again! (I skipped the rosemary too, but everything else was the same). I’m planning on making this for a family party tonight. We have to drive an hour to get there. How well does it hold up after it’s baked? Would I need to reheat it? Aw I’m sorry to hear that, Rosalinda. Underripe brie can get kind of lumpy when baking– perhaps that was the issue? I usually use a good triple creme brie, if that helps for reference! 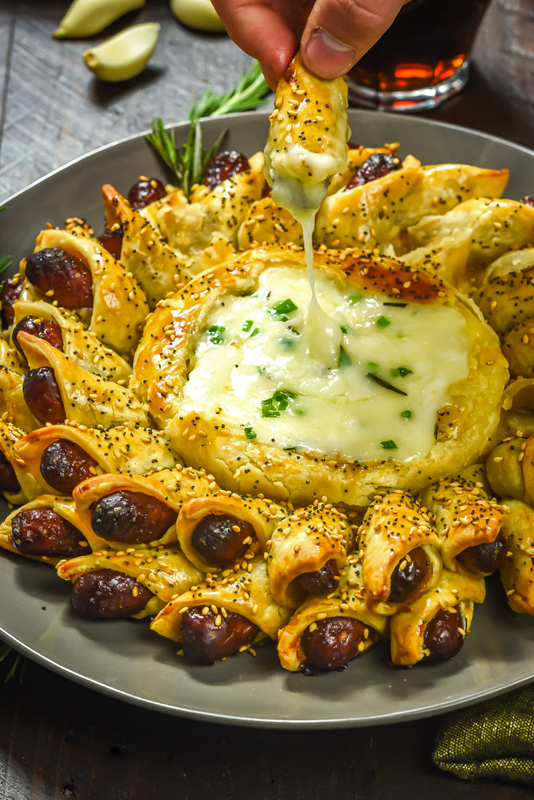 I’m trying this tomorrow but I’m anxious about transferring it to the covered baking sheet… Can you offer a more detailed explanation of how you supported all the wrapped smokies AND the brie in the center while transferring to the baking sheet? I watched the video several times but that step was not included. Thank you in advance and Merry Christmas to you and yours. I made this recipe on a cutting board. I tilted the board slightly and slid the baked brie round onto the baking sheet. If you’re more comfortable making it on top of the parchment, go with your gut and do that! 🙂 Either way you’ve got this! Merry Christmas! I’m going to try this recipe today. What do you think about baking it on a pizza stone? 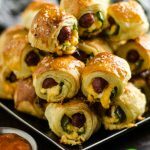 I made this for a Christmas appetizer, and let me tell you…….it really raised the bar for appetizers!!! Very easy, very fun….and very delicious! Would a thin crust pizza dough from Pillsbury work? I cannot find a pie crust that is not premade. Thanks in advance. I made this last night and it turned out exactly like the picture. However, I assembled, cooked and served it on a pizza stone. At 400° it was ready to come out after about 18 minutes. Looked beautiful and golden brown. The next time I make it, I will probably only use one or two items in the brie (i.e garlic or garlic and onion). And the biggest game changer is that after I took it out of the oven, I drizzled it with olive oil and sprinkled on kosher salt. With the poppy and sesame seeds it gave it an “everything bagel” kind of taste. Also served it with brown mustard for dipping. I will definitely make this again. It’s “wreath” look is so pretty for the holidays. I made this yesterday and have a couple of suggestions. First, let the dough rest until it is at room temp, my dough was still cold and that make it prone to cracking when bent over the brie. When cutting the brie, I tried to cut off just the very top rind, and didn’t get it cut into one piece. Since i had about six pieces, I just pitched the rind and put the dough right on top of the brie, that actually worked just fine. I cut the dough into too many pieces (not 18) by mistake, but managed to use them all, either wrapped singly around a Smoky Link or doubled around some. It wasn’t as beautiful as yours, since the pieces where not as uniformly spaced, but it still tasted great and was a hit at the party.